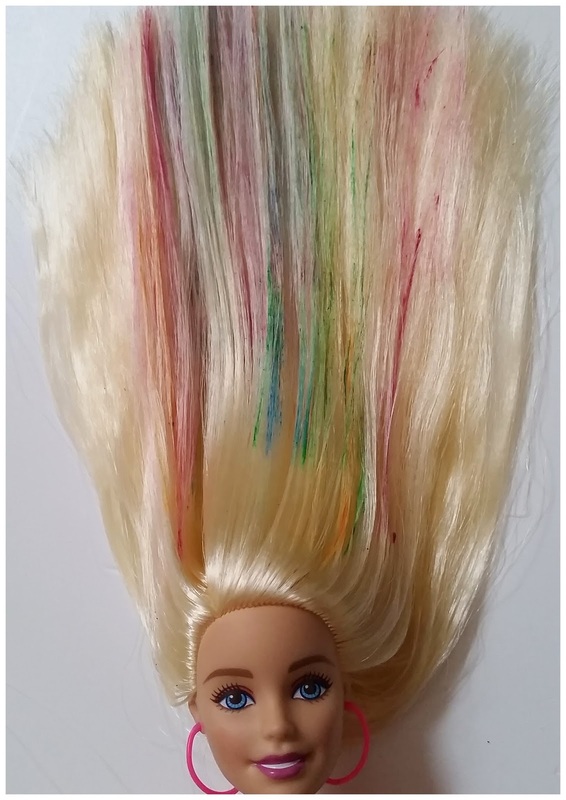 Meet our newest Barbie friend, Barbie Rainbow Makeover Hair Doll from Mattel - Isn't she beautiful. You can add a rainbow of color to her hair with one simple swipe of her tool. It's really easy to use and lots of fun to play with. You simply place a section of Barbies lovely long blond hair into the hair tool and swipe downwards to instantly change the color. There's five vibrant colours to choose from; pink, yellow,green, blue and purple. You can take a small section of hair and just add one colour or use a bigger section of hair to add them all, It's completely up to you. My Lily who's 8 has been having a go doing both. 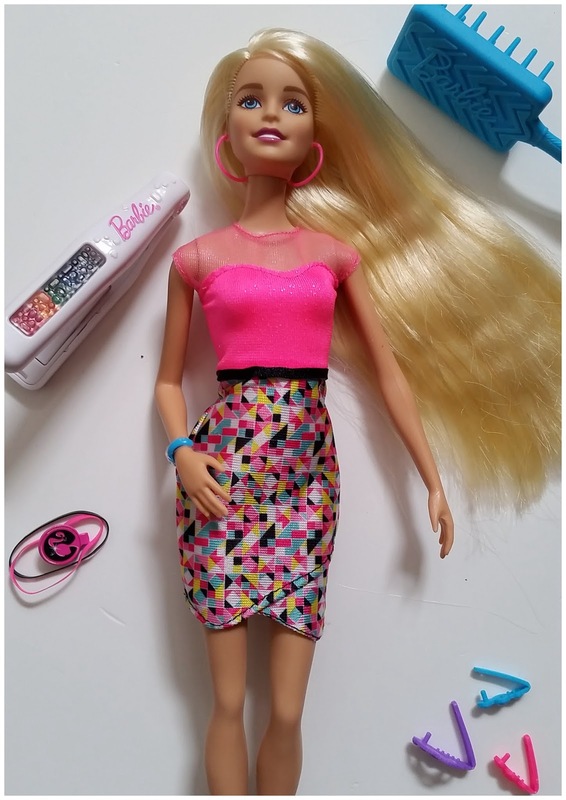 The Barbie Rainbow Makeover Hair Doll has lovely long hair just waiting to be styled. NOt only do you get the colouring tool but you also get two elastic bands, 3 coloured clips and a nice sized hairbrush to help you style her hair. Luckily for Lily, she loves hair styling. Lily loves Barbies outfit as it's bright and beautiful. I mean, who doesn't love neon pink! 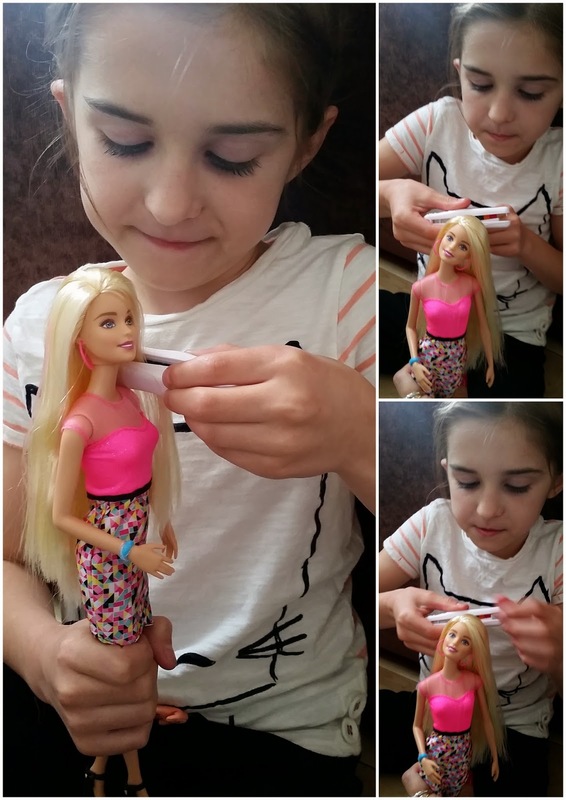 The Barbie Rainbow Makeover Hair Doll is aimed at children aged 5 and over making Lily around the perfect age to enjoy this doll. Lily's got lots of Barbies but it's the ones like this that let you add colour and style the hair that she loves the best. This doll has been on her list of 'wants' for a while so she was more than delighted when she saw it. My only moan is that now that the hair has been coloured, Lily wants to wash it out to start all over again. For her it's all part of the fun but for me it's annoying as this Mummy hates her kids messing with water but we have found a compromise. Barbie is just going to have to wait until it's bath time to wash her hair so that they can both do it together. So really, my moan is not really a moan - it's just me being fussy about letting my kids play with water. In all honesty though, Lily loves her new Barbie Rainbow Makeover Hair Doll and is having lots of fun playing with her. I'm just waiting for the moans when the colours wear out eventually, which by the way she is going won't be too long. I'm not sure what Barbie thinks about having her hair coloured in but I know my Lily sure is happy. Barbie now has bright multicoloured hair, what do you think? Don't worry, Barbie hasn't been harmed in the taking of this picture, I've just cut her body out of the shot so you can see her hair. This is how it looks once it's been coloured. It's kind of cute really. Overall Lily and I are both pleased with Barbie Rainbow Makeover Hair Doll. She comes at a retail price of around £22.99 which is a fair enough price for a Barbie doll with these accessories. When it comes to doing hair, the fun really is never ending. Disclosure: We received our sample in return for an honest review. All the opinions expressed in this review are 100% honest and all my own.